The gentrification of San Francisco has been an ongoing source of contention between renters and working people who live in the city and real estate interests. A subset of this conflict has been an emerging antagonism between longtime working-class residents of the city and the influx of new tech workers. A major increase of gentrification in San Francisco has been attributed with the Dot-Com Boom in the 1990s, creating a strong demand for skilled tech workers from local startups and close by Silicon Valley businesses leading to rising standards of living. As a result, a large influx of new workers in the internet and technology sector began to contribute to the gentrification of historically poor immigrant neighborhoods such as the Mission District. During this time San Francisco began a transformation eventually culminating in it becoming the most expensive city to live in the United States. Many locals in San Francisco attribute the negative effects of gentrification to the large number of technology companies in the surrounding metropolitan area. Private shuttle buses operated by companies such as Google have driven up rents in areas near their stops, leading to the San Francisco tech bus protests from locals in the area. The presence of technology companies in San Francisco is growing exponentially and is spurred by the influx of venture capital to the city from around the world. In 2015, 60% of all new leased office spaces in San Francisco were rented out by technology companies. In 2014, of the $26.8 billion of venture capital funding invested in California companies, 41 percent, or $11 billion, of it went to San Francisco-based hi-tech firms. As of January 2016, 15% of all global venture capital has gone to the San Francisco metropolitan area. Although it is nowhere near the top ranking of cities by economic power through a variety of measures, San Francisco is the undisputed leader of all cities around the world by Venture Capital Rank. In 1990, technology jobs accounted for only 1 percent of San Francisco's economy and have since grown to 8 percent as of 2013. The technology sector accounted or more than 30% of San Francisco's added jobs since 2010. This does not include the thousands of technology jobs that residents in San Francisco commute to outside of the city. As of 2014, about 75% of all rental units in San Francisco are rent controlled. Rising prices, immigration, and the tech boom led to a cultural and demographic shift in the city. From 1990-2010, San Francisco gained 2,000 white residents, 32,000 Asian residents, and 13,000 Hispanic residents while the African American population decreased by 18,000 people. According to the American Community Survey, during this same period, an average of 60,000 people both migrated to San Francisco and migrated out. The people who left the city were more likely to have lower education levels, and have lower incomes than their counterparts who moved into the city. In addition, there was a net annual migration of 7,500 people age 35 or under, and net out-migration of over 5,000 for people 36 or over. For all of these demographic statistics, the rate of change has accelerated from 2005-2007 to 2010-2014. Migration and demographic patterns are continuing to rapidly shift in San Francisco. From 2010 to 2014, the number of households making $100,000 or more saw an average growth rate of 17% while households making less than $100,000 saw an average growth rate of -3%. [dead link] Of all multifamily rental units constructed from 2012–2014, 85% of new real estate construction in San Francisco has been luxury. Many of the people living in San Francisco do not work in the city. Many more live in the suburbs and commute into San Francisco every day. High rents in Silicon Valley and other factors have contributed to a phenomenon where many tech workers choose not to live closer to work in Silicon Valley and instead stay in San Francisco. A survey conducted by the Bay Area Council and the Metropolitan Transportation Commission has found that 35 shuttle services operate a fleet of more than 800 buses that ferry 34,000 commuters every single day around the San Francisco Metropolitan Area. Of these shuttles, over 200 of them travel exclusively between San Francisco County and Santa Clara County. One major observed consequence to the Gentrification of San Francisco has been the rising number of eviction notices seen all throughout the city. Since 2009, the number of evictions has been increasing every single year in San Francisco and from 2014-2015 there were over 2,000 eviction notices filed with the rent board. This period represents a 54.7% increase in evictions over the five previous years. Houses in San Francisco, with a median listing price of $ 1,000,000, lead low and middle classes to conform the list of renters being therefore the most impacted by the escalating number of evictions. In retaliation to the rapidly changing socioeconomic landscape of San Francisco, accelerated by the influx of high paying technology jobs, anti-eviction movements such as the San Francisco Tenants Union,Causa Justa :: Just Cause, Right to the City Alliance, and People Organizing to Demand Environmental and Economic Rights (PODER) have been created by the local community as a measure to hinder the effects of gentrification. Besides tenants' rights, social, economic, environmental and cultural public concerns have also been addressed by The Mission Anti-displacement Coalition (MAC), an organization created by PODER to counteract the effects of gentrification in the late 1990s due to the raise of tech jobs. Breach of lease - Under the Rent Ordinance tenants may be evicted for violating any terms of their signed lease agreement. Nuisance - Tenants who regularly disrupt “the comfort, safety or enjoyment of the landlord or tenants in the building” are subject to eviction. Ellis Act - The California law permits evicting all tenants if the owner intends to stop renting. Illegal Use - An eviction method used to get rid of tenants engaged in illegal activities. This justification is now used to evict tenants from "illegal" units that exist because a landlord failed to get permits. Relative to all evictions, evictions with the five justifications above increased by 82.5% over the same five-year period. These movements have also focused on mitigating evictions from "no-fault" evictions such as those caused by the Ellis Act. In November 2014 a ballot measure was put forward which would put a tax on real estate speculation. Proposition G led to a virtual halt of Ellis Act evictions in the months leading up to the election. After the proposition was narrowly defeated, the number of evictions from the Ellis Act more than doubled from 2014-2015. San Francisco-based technology companies such as Airbnb are actively involved in city politics to advance their interests in the city. In response to Airbnb's impact on the housing market in San Francisco, housing activists have called for restrictions on the company's listing practices to limit the number of short-term rentals in the city. Airbnb spent more than $8 million to defeat a single proposition in San Francisco that would restrict the number of rentals in San Francisco. In September, Airbnb began the process to sue the City of San Francisco to retaliate against new regulations. As the fourth most populous city in California, and the 13th-most populous in the United States, with a 2016 census-estimated population of 870,887, San Francisco has multiple neighborhoods that experienced gentrification during different time periods. Below are a few of the areas that have been most gentrified in San Francisco. Chinatown, San Francisco is an area in which many immigrants and small business owners reside and have been subject to mass gentrification. Due to the free landscape and convenient location of Chinatown, large businesses are attracted to the area and many small businesses in the area have been unable to make ends meet as a result. There have been multiple attempts through policy initiatives to try to preserve cultural value in Chinatown and slow down gentrification. The Chinatown Resource Center made an attempt to prevent developers who want to purchase land in Chinatown to create offices; however, 1,700 previously occupied residential units were still converted into office space. As a response, the Chinatown Resource Center created a proposal to make structural changes in land use policy to decrease or slow "revitalization." Furthermore, Chinatown Core's Planning department created the 1986 Rezoning Plan, which prohibited demolition and converting residential buildings in Chinatown Core for alternative needs. However, all other parts of Chinatown, such as the Chinatown North and Polk Gulch were not protected by this plan (only Chinatown Core was). Thus, many Asian communities in non-Chinatown Core areas suffered from threats of buyouts and eviction. For example, the number of Asian residents in Chinatown's Polk Gulch neighborhood decreased from 3,519 to 2,527 from 1980 to 2013. In addition, the majority of these Asian residents were replaced by white residents. Though policy initiatives have slowed down gentrification in Chinatown, it has not prevented it. Both Asian American Chinatown residents and Asian American individuals who do not live in Chinatown have protested gentrification in the Chinatown area in order to preserve the culture and history of the space. Many community-based organizations have also worked together in protest. For example, the Chinatown Community Development Center (CCDC) and the 1,000 member Community Tenants Association work together on cases such as evictions towards elderly or people with disabilities in Chinatown. Furthermore, many Chinatown residents use their own social networks to preserve culture in their spaces. Local Chinese newspapers are often utilized to notify community members of open places for rent as opposed to mainstream outlets such as Craigslist to ensure information is safe and protected amongst community members only. Mission District, San Francisco is heavily populated with Latino communities and has historically been subject to gentrification from growth and expansion of technology. For example, the cost of living and rent prices in the Mission District increased in the late 1990s after the Dot-com bubble boom. The Mission District was chosen as a place for many higher-income, white tech workers to reside because of the culture of the Mission District, the high density of the neighborhood and the multiple forms of transportation infrastructures available in the area to the Financial District and Silicon Valley. Along with an increase in rent prices, the value of the Northeast Mission Industrial Zone (NEMIZ) decreased and was replaced by tech-based work. The dot-com boom is also known as the Mission District's first wave of gentrification. After the dot-com bubble burst, the Mission District experienced less gentrification during the period of economic recovery, however, it remained an area with an increasing influx of high-income, tech workers. Since 1980, the Latino population in the Mission District decreased from 44% to 38% in 2013. This was coupled with an increase in the population of white folks in the Mission District from 36% in 1980 to 43% in 2013. Furthermore, the number of residents in the Mission District without a high school diploma decreased from 41% in 1980 to 17% in 2003, while the number of residents in the Mission District with a four-year college degree increased from 18% in 1980 to 52% in 2003. San Francisco's Mission District has historically been a working-class area. From the early 1960s onward the Mission has been predominantly populated by working and low-income people whose first language is Spanish, many of them recent immigrants. The dot-com boom of the mid to late 1990s saw an intense acceleration of Mission gentrification. Residents of the Mission who have felt threatened by gentrification responded in various ways. A notorious example of resistance was the 'Mission Yuppie Eradication Project,' an anti-capitalist direct action group which advocated and committed acts of vandalism and sabotage of expensive vehicles, luxury housing, and bars and dining establishments catering to wealthy newcomers. The MYEP aimed at defining gentrification in terms of irreconcilable conflict between classes and elicited a considerable amount of media coverage. Mission gentrification has also triggered responses from a variety of organizations, movements and artistic expressions. Street art can be seen on roads and alley-ways in the Mission District describing the negative effects of gentrification. For example, street art on the corner of 19th and San Carlos depicting ten sea turtles says: "Latino Art Only," indicating discontent from gentrification as well as from the influx of white folks in what has been a primarily Latino neighborhood. The Mission District is also the heart of San Francisco's protests. The San Francisco tech bus protests occurred in the Mission District, to fight against gentrification and displacement caused by the tech boom, as well as rising prices of rental housing. Silicon Valley's technological rise has also led to gentrification of the broader Bay Area. This includes East Palo Alto, where Hispanic and African Americans have begun to move out in face of rising costs. The flourishing of technology sector at Silicon Valley and rapid recovery from the Great Recession have caused for the job market to skyrocket for popular professions, while others declines. Burlingame, Mountain View, San Jose, and Santa Clara are also affected by Silicon Valley's growth, as the region has no defined bounds and continues to proliferate along the central coast. African Americans comprised almost half of homeowners and renters in North Oakland in 1990s, yet by 2011, this number have dropped by almost 30%. Even though African Americans represent the majority of the population in Bay area cities, they are more likely to be displaced and gentrified due to low socioeconomic status and less financial wealth. In fact, there is a strong correlation between gentrification and the susceptibility of people of color being evicted and facing housing suppression. For instance, West Oakland used to be the center for Black cultural life on an international scale in the late 1900s, however, only 28% of the African American community made up the whole Oakland population in 2010. First Wave (1950s-1990s): The First Wave of gentrification occurred during the period of blooming technology, and rapid modernization of the society. The discourse surfaced when San Francisco emerged as the center of technological development that gave rise to rapid job growth and transformation of the housing market dynamics. Communities of color in the Bay Area began to see the arrival of new millionaires, which gave landowners opportunities to engage in the process of evictions and drastically increase in rent. Numerous reports state that during this period of time, the number of faultless evictions in Oakland tripled while rent increased more than 100 percent. Second wave (2000- 2015): The transition of housing market dynamics in the Bay Area then did not just create housing crisis, but an intensification of gentrification also known as the second wave. This period is characterized by a drastic increased in borrowing predatory loans by residents in order to combat the effects of gentrification. However, many of the loans offered did not include income verifiability so many homes were foreclosed, affecting thousand homeowners and tenants living in the Bay Area. Third wave (2015- current): The Bay Area is now currently facing a new wave of gentrification caused by the expansion of technology industry and investment of private business developers. New businesses open everywhere to replace long-term communities, and causes the constant migration of tenants all over the Bay Area. This period is marked by the heightened eviction, displacement rates that contribute to the growing inequity and exacerbated poverty rates. ^ Nieves, Evelyn (2000-11-05). 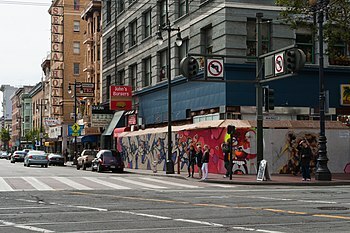 "Mission District Fights Case of Dot-Com Fever". The New York Times. ISSN 0362-4331. Retrieved 2016-10-06. ^ "America's 20 most expensive cities for renters". Business Insider. Retrieved 2016-10-20. ^ CNN, John Defterios and Adeline Chen. "San Francisco edges out Silicon Valley". CNN. Retrieved 2016-11-16. ^ "Why San Francisco is the new tech titan, not Silicon Valley | JFE Network". jfenetwork.com. Retrieved 2016-11-16. ^ "Sorry, London: New York Is the World's Most Economically Powerful City". CityLab. Retrieved 2016-11-16. ^ Florida, Richard. "The Global Cities Where Tech Venture Capital Is Concentrated". The Atlantic. Retrieved 2016-11-16. ^ "Forecasting San Francisco's Economic Fortunes". SPUR. 2014-02-27. Retrieved 2016-11-16. ^ a b c d Diamond, Rebecca; McQuade, Tim; Qian, Franklin (2017-10-11). "The Effects of Rent Control Expansion on Tenants, Landlords, and Inequality: Evidence from San Francisco". National Bureau of Economic Research. Retrieved 2018-08-07. ^ a b c d e Robertson, Michelle (2017-11-03). "Rent-control policies likely 'fueled' SF gentrification, Stanford economists say". San Francisco Chronicle. Archived from the original on 2017-12-03. Retrieved 2018-08-07. ^ "Bay Area Census -- San Francisco City and County". www.bayareacensus.ca.gov. Retrieved 2016-10-20. ^ Bureau, U.S. Census. "American FactFinder - Community Facts". factfinder.census.gov. Retrieved 2016-11-13. ^ "Quantifying the Changing Face of San Francisco". Priceonomics. Retrieved 2016-11-13. ^ Bureau, U.S. Census. "American FactFinder - Results". factfinder.census.gov. Retrieved 2016-10-25. ^ Kusisto, Laura. "San Francisco Rejects, Luxury Housing Moratorium". WSJ. Retrieved 2016-11-16. ^ United States. Bay Area Council and Metropolitan Transportation Commission. 2016 Bay Area Shuttle Census. N.p. : METROPOLITAN TRANSPORTATION COMMISSION, 2016. ^ "Real Estate Data for San Francisco". Trulia. Retrieved 28 November 2017. ^ Garcia, Jessica Christina. "The Rise of the Millennial Cohort: A Case Study of the Effects on San Francisco's Rental Housing Market" (PDF) (2015): 60. Retrieved 23 November 2017. ^ "San Francisco Tenants Union". San Francisco Tenants Union. Retrieved 23 November 2017. ^ Murphy, Katy. "Rent-control policy `likely fueled the gentrification of San Francisco,' study finds As California debates rent caps, economists offer a cautionary note" (November 2, 2017 at 10:46 am). The Mercury News. Bay Area News Group. Retrieved 23 November 2017. ^ a b The Oxford Encyclopedia of Latinos and Latinas in the United States. Oxford Reference. People Organizing to Demand Environmental and Economic Rights (PODER). 2005. doi:10.1093/acref/9780195156003.001.0001. ISBN 9780195156003. Retrieved 28 November 2017. ^ Cespedes, Sydney; Crispell, Mitchell; Blackston, Christina; Plowman, Jonathan; Graves, Edward. "Community Organizing and Resistance in SF's Mission District" (PDF). Center for Community Innovation, University of California, Berkeley (June 2015): 30. Retrieved 23 November 2017. ^ Project, Anti-Eviction Mapping. "Ellis Act Evictions - Anti-Eviction Mapping Project". www.antievictionmappingproject.net. Retrieved 2016-11-16. ^ "Prop. F: S.F. voters reject measure to restrict Airbnb rentals". SFGate. Retrieved 2016-11-18. ^ "Airbnb throws first punch against regulation-happy cities". Retrieved 2016-11-18. ^ "We are here: Oral Histories San Francisco". Anti-Eviction Mapping Project. ^ "HEART OF THE CITY". HEART OF THE CITY. Retrieved 2016-11-11. ^ Yee, Cameron. "There goes the neighborhood : a regional analysis of gentrification and community stability in the San Francisco Bay Area". ^ Casique, Diaz. "Race, Space and Contestation : Gentrification in San Francisco's Latina/o Mission District". ^ Opillard, Florian (2015-12-31). "Resisting the Politics of Displacement in the San Francisco Bay Area: Anti-gentrification Activism in the Tech Boom 2.0". European Journal of American Studies. 10 (Vol 10, no 3). doi:10.4000/ejas.11322. ISSN 1991-9336. ^ Montojo, Nicole. "Chapter 3: Chinatown Case Study" (PDF). Gentrification and Displacement in the San Francisco Bay Area. ^ Phillips, Lucy. "Revitalized Streets of San Francisco: A Study of Redevelopment and Gentrification in SoMa and the Mission". ^ Barros, Joe Rivano. "Gentrification, Shadows Concern for Mission and Housing Project". Retrieved 26 October 2016. ^ "When San Francisco Rebelled Against The Techies". BuzzFeed. Retrieved 2017-10-26. ^ "Anti-Gentrification Graffiti Paints Picture of Artists' Struggle for Space". MissionLocal. Retrieved 2016-11-20. ^ Cespedes, Sydney. "case studies on Gentrification and Displacement in the San Francisco Bay Area". ^ a b Waters, Richard (2017-08-24). "The great Silicon Valley land grab". London: Financial Times. Retrieved 2019-03-21. ^ Levin, S. (2014,). The fight to develop West Oakland. Eastbay Express. ^ Atkinson, Rowland (2012). "Does Gentrification Help or Harm Urban Neighborhoods? An Assessment of the Evidence-Base in the Context of the New Urban Agenda" (PDF). ESRC Centre For Neighborhood Research. ^ Whittle, Henry J.; Palar, Kartika; Hufstedler, Lee Lemus; Seligman, Hilary K.; Frongillo, Edward A.; Weiser, Sheri D. (October 2015). "Food insecurity, chronic illness, and gentrification in the San Francisco Bay Area: An example of structural violence in United States public policy". Social Science & Medicine. 143: 154–161. doi:10.1016/j.socscimed.2015.08.027. ISSN 0277-9536. PMID 26356827. ^ a b Irvin, Karessa (2016-01-01). "Maintaining community roots : understanding gentrification through the eyes of long-standing African American residents in West Oakland". Theses, Dissertations, and Projects. ^ Kennedy, Leonard, Maureen, Paul (July 2001). "Gentrification: Practice and Politics". Home Ownership Summit 2000 Research Series. ^ Alkon, Alison Hope; Alkon, Alison Hope (June 2018). "ENTREPRENEURSHIP AS ACTIVISM? RESISTING GENTRIFICATION IN OAKLAND, CALIFORNIA". Revista de Administração de Empresas. 58 (3): 279–290. doi:10.1590/s0034-759020180308. ISSN 0034-7590. ^ Atkinson, Rowland (2015). "Losing One's Place: Narratives of Neighbourhood Change, Market Injustice and Symbolic Displacement" (PDF). Housing, Theory and Society. 32 (4): 373–388. doi:10.1080/14036096.2015.1053980. This page was last edited on 3 April 2019, at 05:07 (UTC).